The Jordans volunteered at a local orphanage with 22 wonderful children that warmed their hearts but needed some help. The new home that their orphanage father rented for the lot needed some major repairs and basic necessities. So with the development of Little Bit of Sunshine and it’s kind sponsors, Daniel and Joanne were able to do so much. Read More about the Sahara Project. How could a few average people do some good in this crazy world?? The answer, a little at a time. The founders, Daniel and Joanne Jordan decided to set out for the world to gain some real life experiences and see if they could help those less fortunate. Their travels brought them to Nepal, a land vast in natural resources and beauty but lacking in education and economic growth. In continuing their work, Little Bit of Sunshine will continue to raise money and strive to find other amazing projects to serve. Our organization is also sponsoring a unique Open Invitation program for others to visit Nepal and work with the children at the Sahara Orphanage, ask us about it! 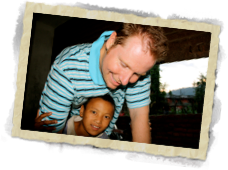 Planning on another trip to Nepal in 2011 to visit the Sahara Orphanage. Hoping to engage others to join us. Raising funds toward keeping our Nepalese friends in school and building a computer classroom to teach them valuable computer skills for their future. Hoping for a 2014 trip to the Philippines to explore and volunteer at a local orphanage.